Nope, I’m not talking about 1985. 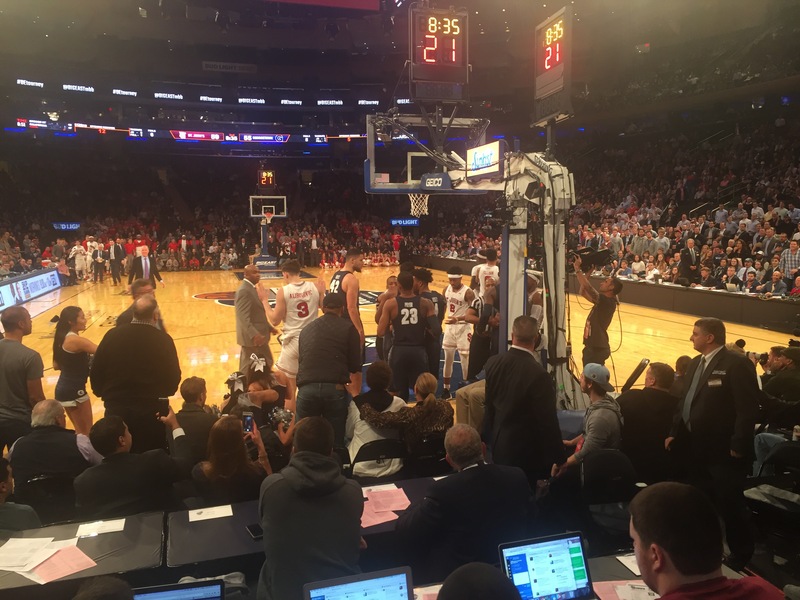 The 2nd half of Wednesday’s 2017 Big East Tournament game invoked those names as St. John’s Coach Chris Mullin was assessed a technical for engaging and charging Hoyas Coach John Thompson Jr. and Georgetown reserve and Hoyas legend Patrick Ewing’s son, Patrick Ewing Jr. (Ewing Jr. also received a technical) after a hard foul committed by St. John’s Amar Alibegovic that saw both teams gather under the basket and push and shove each other. The roar from the Garden crowd after the incident invoked memories of the 1980’s where St. John’s and Georgetown were the marquee matchup in the Big East Conference. Tonight, they were two teams battling to play one more game in the 2016-17 season in the first round of the Big East Tournament. The game went to the wire with the Red Storm getting the 74-73 win to advance and play Villanova tomorrow. A melancholy John Thompson Jr. was in no mood to assess his season or his future as Georgetown’s coach after the game. This year was the Hoyas (14-18) second consecutive losing season and a impassioned fan base wants better results. “They’ll be a time to evaluate this season but tonight isn’t it.”, said Thompson. The Red Storm have shown significant improvement in Mullin’s two seasons at the helm but they have a short turnaround before playing #1 seed Villanova at noon on Thursday. What the crowd did see tonight is a glimpse of their future with Ponds excellent play mixed with their past with Mullin’s fiery competitiveness. Ewing Jr. told Mullin he loved him but tonight proved there’s no love lost between these two rivals. The Big East may be different in 2017 than it was in 1985 but when the Garden is roaring with St. John’s and Georgetown fans during a competitive game, the scene is timeless.